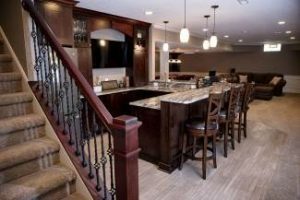 One of the more popular renovations that The Remodeling Pro does in Kansas City is a basement remodel – media rooms, game rooms, family rooms, bedrooms and baths. For over 36 years The Remodeling Pro has office high quality remodeling for every room in the home, but basements are different. Basements take experience. Planning a new room addition in a basement can involve checking for mold, water damage and floors that have become uneven over the years. At The Remodeling Pro we make sure that none of these issues cause you to throw good dollars after bad. Your basement may be unused empty space today, but you must make sure it’s capable of holding up to the remodel you plan. One simple leak could ruin thousands of dollars’ worth of effort and beauty. Call The Remodeling Pro today to set up an appointment, we will listen to your wants and needs, inspect the space and make sure we are aware of anything that must be resolved prior to or as part of the basement renovation process. Let us help you transform that wasted lower level into a fully finished and useable part of your home. Our talented Project Managers can help you create a plan that works for everyone in the home. They can make suggestions when necessary like egress windows, organized floor plans and economical materials that are hot and trending. We will identify any existing or potential code issues and determine solutions for them. We can even introduce you to an interior designer to make you new kitchen fit your personality perfectly. Your basement has endless potential, let The Remodeling Pro show you how to make it work for you. The Remodeling Pro can design and construct a new basement space that makes works for you. Call today us (816)268-9800 or contact us online to start the remodeling project today! Remember you are always in charge; we promise to respect your home by cleaning up every night during the project and finish on your project on time and on budget. So you can enjoy your new basement (media room, sports bar, workout space, guest room) for many years to come. Functional layouts, backsplashes, countertops, flooring, islands, lighting, organizers and more. The Remodeling Pro we can build on to your preexisting structure to suite your needs.